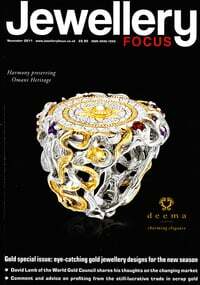 The other day I had an excited text from a jeweller friend, saying she had just read a great article about my jewellery in this month's Jewellery Focus magazine. Naturally I got straight on the phone to them for a copy! Read the article in full by clicking here. 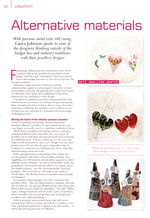 The article features three makers who don't use traditional materials to produce their work. 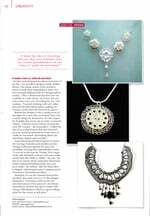 One of the other makers, Kate Hamilton Hunter recycles old biscuit tins into lovely jewellery. Earlier this year our stands were near each other at Top Drawer, in fact there were a few of us who became friendly and have made sure that we are next to each other next year too!